Fallout from Signet Jewelry’s sexual harassment and discrimination suit from February seems to be impacting female consumers as the crucial holiday season is in full swing, according to YouGov BrandIndex. Signet’s brands – Jared, Kay, and Zales – are experiencing lower levels in two key metrics with women compared to one year ago. Not only is their perception down, but so is their Purchase Consideration, YouGov BrandIndex’s measurement of potential sales revenue. This downturn allowed Pandora, the 22nd largest specialty jeweler in North America, to move ahead of them in those two metrics this holiday season. Signet is the largest company in the category. Currently, 8% of women would consider buying jewelry next time at Pandora, compared to 7% at Zales and Kay, and 5% at Jared. Pandora’s achievement is even more impressive considering they have the lowest Ad Awareness by women of all four brands. 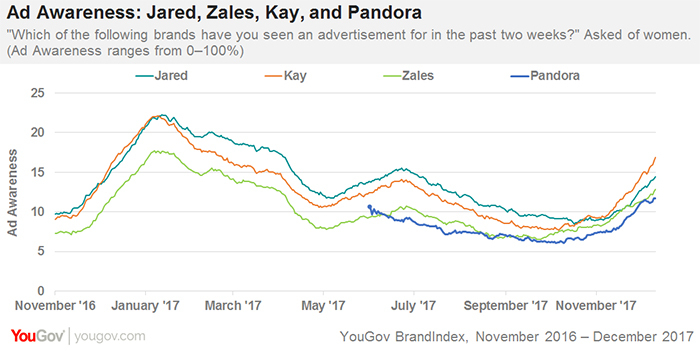 Since Ad Awareness levels began their annual holiday ascent in early November, second place Kay Jewelers overtook Jared to go from 8% of women saying they saw one of their ads in the past two weeks to currently 17%. YouGov BrandIndex began tracking Pandora on June 1, 2017. 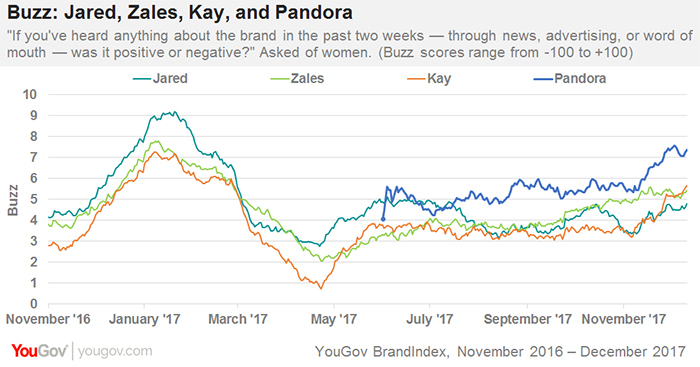 YouGov BrandIndex measured perception of the jewelry brands using its Buzz score, which asks respondents: "If you've heard anything about the brand in the last two weeks, through advertising, news or word of mouth, was it positive or negative?" A score can range from -100 to 100 with a zero-score equaling a neutral position.